Beach volleyball is an intense sport that requires good stamina and strength. Training various muscles of the body (core, lower body, upper body) to become stronger will allow you to hit harder and jump higher. 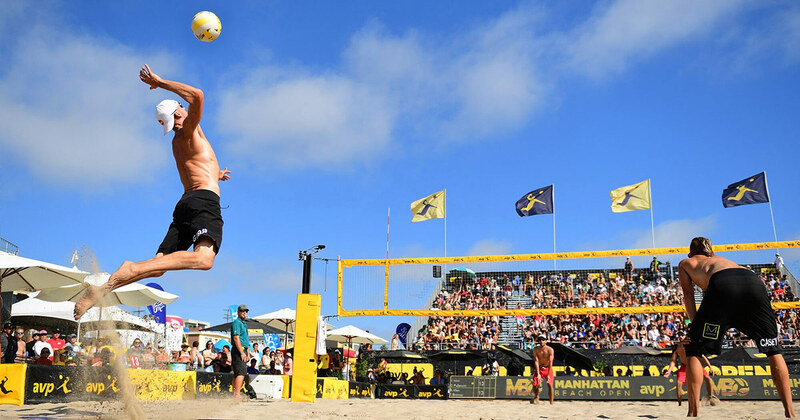 Easily train on the sand using medicine balls, sand bags, kettle bells, or resistance bands with these specific exercises below. 1) Scissor kick: Lie down flat on your back with your arms extended straight out to the side, palms faced down. Raise one leg from the ground and then back down. Switch to the other leg. Do 16 reps for 3 sets with 1 minute rest in between each set. Variation: increase the difficulty of this move by placing a resistance band over your thigh area. 2) Extended plank: start in a plank position withour elbows a few inches in front of your shoulders. Straighten your trunk and legs so that they are in line. Hold your abs tightly for 45 seconds to 1 minute. One set. 3) Medicine ball slam: Hold a medicine ball with both hands and stand with your feet shoulder width apart. Lift the ball above your head, extending your whole body and slam the ball into the ground directly in front of you. Do 10 reps for 3 sets with 1 minute rest in between each set. 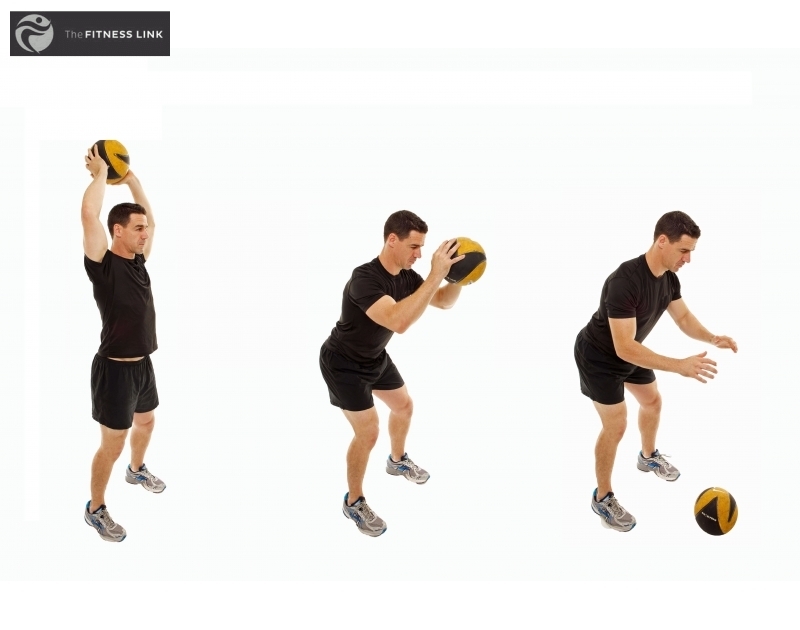 1) Squat jump twist: Stand with your feet shoulder width apart and squat down until your knees are at a 90 degree angle. Stand upwards and jump up in the air. Rotate 90 degrees as you jump up and land on both feet back to the starting position. Do 10 reps for 3 sets with 1 minute rest in between each set. 2) Glute bridge walkout: Lie down flat on your back with your knees bent at a 90 degree angles and feet flat on the ground. Drive your hips up to end range, careful not to over flare your ribs. Slowly walk your feet out, one heel at a time and then return to the starting bridge position. Do 10 reps for 3 sets with 1 minute rest in between each set. Variation: increase the difficulty of this move by placing a resistance band over your thigh area. 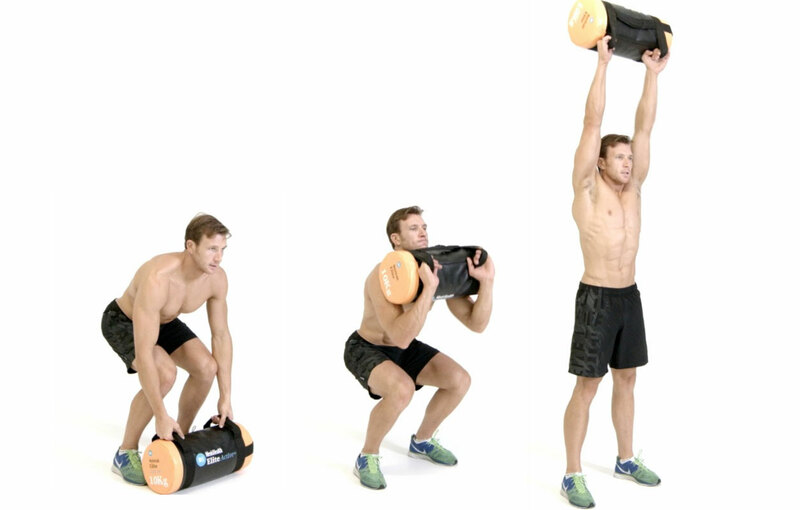 1) Push press: Use a sandbag, medicine ball, or kettle bell and hold firmly with both hands in front of the chest. Push your sandbag or kettle bell straight up to the sky over your head. Do 10 reps for 3 set with 1 minute rest in between each set. 2) Push ups: Starting in the plank position, place your palms onto the ground under your shoulders and lock out your elbows. Dig your toes into the ground and keep the feet close together. Slowly lower your body down until you are a few inches off the ground. Then push your body up to the starting position. Do 10 reps for 3 sets with 1 minute rest in between each set.